THE Scottish Office has been accused of encouraging farmers to take the law into their own hands, after the issue of a licence to kill internationally protected barnacle geese. A beef farmer, Daniel Quinn, of Powhillon Farm, at Caerlaverock, on the Solway, has, for the second year been given permission to shoot the winter visitors from the Artic, which he claims are destroying his farmland. Mr Quinn is the only person in Scotland allowed to kill the birds, which are protected on their breeding grounds on the Norwegian island of Spitsbergen and on their wintering grounds on the Solway. Last year he shot ten geese to encourage the grazing flocks to leave his grassland. rhill rhill This week, Scottish Natural Heritage (SNH), the Government environment agency, will attempt to defuse the row by offering farmers a one-year pilot scheme in which they would be paid compensation for putting up with geese on their land. Around 13,700 geese - the entire Spitsbergen population - now winter on the Solway. The figure has increased from under a few hundred in the 1950s. Several farmers are waiting to hear what is on offer from SNH before deciding on applications to the Scottish Office agriculture and fisheries department for licences to kill. Mr Quinn, however, has no plans to take up the cash offer. He claimed that the money being offered by the agency was insulting.Mr Quinn claimed he had been forced to reduce his herd of beef cattle because of the loss of grassland to the geese, which tear out plants by the root and compact the surface of the field. lands Trust at Caerlaverock nature reserve. According to the trust, the licence was approved after Mr Quinn threatended to shoot the birds, whether he was granted a licence or not. The WWT director-general Dr Myrfyn Owen, said: "This decision could be read as a clear signal from the Scottish Office that it pays to take the law into your own hands. 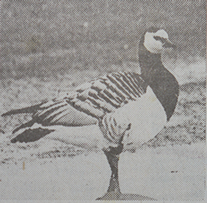 The licence has been granted, despite the fact that relatively small numbers of geese use this particular farm."